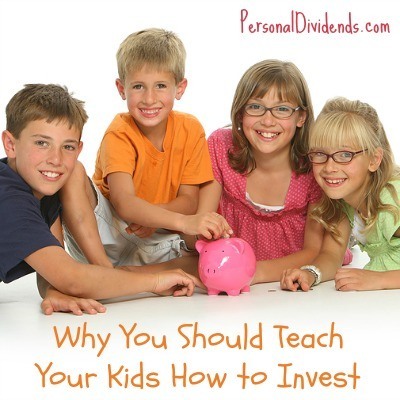 We all have a number of skills, habits in activities that we like to teach our kids, but have you ever given thought to teaching your kids how to invest? There are more than a few reasons why you might want them to adopt this skill early in life. With all they will learn in school, you can bet your kids will not learn how to invest. In fact, schools barely teach anything to kids about money. If they’re going to learn anything about money – and specifically about investing – they’ll have learned from you. Most young people entering the adult world are completely lacking when comes to investing. There are all kinds of nice looking projections that will show how you could accumulate millions of dollars by the time you retire if you start investing in your 20s, but it’s not always that easy. Investing often starts out as a three steps forward, two steps backward process – you have to make a few mistakes before you start learning how to earn real money on your money. If you start your kids early enough in life, they can make some of those mistakes well before adulthood when the stakes in life are higher. When it comes to money, there are a few habits that we hope our kids will learn early on. Some of these might include learning to save money, avoiding debt, and even knowing where to find financial information when it’s needed. It’s possible to teach kids all of that, and to do it early enough in life that will become a lifelong habit. You can do the same thing with investing. You can start them out at whatever age you think is appropriate. That will be different for each child – some may be ready at 10, and others will be struggling with the concept at 15. But better to expose them to the idea and the practice sometime during childhood, that way they’ll carry it into adult life. So much of financial success in life really is based on good habits. If you can get them into the habit of investing early enough, they may see investing success sooner in life than their peers. Yet another advantage to teaching your kids about investing is to give them plenty of time to make mistakes while they’re learning. It will be better for them to make investing mistakes when they are young, and have plenty of time to make up for any losses, and also when they’re only playing with a few thousand dollars. It will be far worse if they begin investing when they’re in their 40s, have a family to support, and can’t afford to lose any money. Lessons they will learn now will help them in a positive way for the rest of their lives. Most parents hope that their children reach adulthood having sufficient career skills and education to be able to earn a decent living. But what if your child can do that – and have a decent sized investment portfolio to? If you teach your kids how to invest early in life, it just might happen. As an example, let’s say your 12-year-old has $10,000 sitting in a savings account. If you move that money to an online brokerage account and invest in stocks and mutual funds with an average annual return of 10% per year, after 10 years the nest egg will grow to nearly $26,000. Your now 12-year-old will then be 22 years old, which is right around the time he or she will be graduating from university. Do you think that such a nest egg would give them a solid running start into adulthood? This concept is hardly a stretch. Everyone is worried about government budgets and the ability of federal programs and pensions to provide an adequate retirement. The answer is always to invest more, and to invest better. In addition, since jobs and careers have become much less stable than they once were, the ability to build and to grow an investment portfolio really has become a survival skill. You need some other source of sustenance when the regular paycheck isn’t cutting it. Up until World War II, most people understood the concept of saving money as a survival skill for many of the reasons that we’re seeing now. But back then, simply saving money was sufficient. After all, there was no inflation! Today we do in fact have inflation, and that means we need to be able to grow the money that we have. That’s what investing is all about – isn’t that a skill worth teaching your kids?